I was discovered by Xhanfise Keko when I was very small, just four years old. A few days after this she came to my house and spent a while talking with my parents. Before leaving she told me that she was very excited that we would soon be working on movie together with some of my other classmates, and that we would build a large city on in the garden of our school. I was overjoyed , even though I was too young to understand exactly what Teta Xhano was explaining to me that day in 1973, that marked the beginning of my career in cinema. The movie Qyteti më i ri në botë (The Newest City in the World, 1974) is very dear to me. The school that was constructed for the film seemed to me the most beautiful school in the world, full of the best of everything, including toys. But, this film is also where I developed my spiritual connection to Teta Xhano. I remember one day when I saw the bus leaving the Kinostudio to film in our school, that I was crying, just as I was after the premiere of the film when I thought I might no longer get to spend time with Teta Xhano. During the filming, I would often go for lunch at her house . While on Sundays , Teta Xhano and Uncle Endri would take me with them when they walked out on the great boulevards in Tirana . Even today, I want to smile when I remember all the passersby who would stop and ask them who I was, and they would always answer: "Our daughter." Fortunately, 1974 would not be the end of my time with Teta Xhano, 1975 brought the gift another role, that of Jeta in Beni Walks on His Own (1975). Today, that little girl who played Jeta has grown up, married and become a mother herself. Still, it is wonderful that whenever I meet fellow Albanians in America where I now make my home, again the introduction begins with, " This is little Jeta from the film Beni Walks on His Own.Beni was different than the first film. This time I had to leave my parents for almost three months. This time away from home and with Teta Xhano strengthened my bond to her. For all intents and purposes, she was now my mother, and, as such, I followed behind her, wherever she went. I remember those days on the set of Beni well. 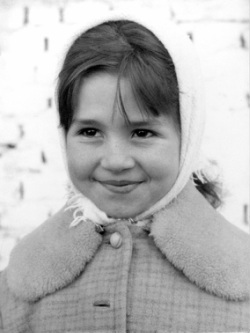 They began with Teta Xhano making sure all the child actors woke up on time and ate breakfast without quarreling. She would keep an eye on all of us during the filming and in addition to the shooting , she made sure that we ate lunch each day in the shade, as if we are at home in our own schoolyard. In the evenings, as the sun was going down and shooting was ending for the day, she would make sure that we all had a proper dinner. The days activities ended with Teta Xhano assured that all her children had eaten, and with our heads hanging heavy at the table, with eyes half closed from fatigue. Even Teta Xhano would sometimes fall asleep with us at the dinner table! The film Tomka and His Friends was the third and final film that I made with Teta Xhano. After that, I acted in three feature films with other directors. Now that I am all grown up, I can appreciate even more the valuable advice from my beloved Teta Xhano," Selma, do not imitate others , but try to be yourself, in this way you will be unique and you will be remembered.” I have heeded this advice always, and I have always kept my love for Teta Xhano. She was now a part of my soul, but she did not just belong to me. More than three decades later, I reflect on the life lessons I learned by observing and working with Teta Xhano. Her life journey and success required patience, dedication, and sacrifice. It was a journey that included disappointments, but also much love. I am also convinced that when Teta Xhano touched the hearts of we children that we touched her heart in return, and that this woman rarely realized how full her heart was and how much it overflowed with the love we all shared with her and for her. Above all, today I am glad that I got to be one of "Keko's kids." Translated and abridged from her chapter in the memorial book Teta Xhano. Selma Sotillari was born and raised in Tirana, Albania. She studied foreign languages and literature at the University of Tirana and now makes her home in Florida, USA where she works as a pharmacist.